1. With the Edge browser open, visit https://www.GoodGopher.com inside the Edge browser. Please Note: GoodGopher.com needs to be open so Edge can discover it as a search engine option. 2. Once GoodGopher.com has loaded, go to the "Setting" menu. 3. Scroll down and click the "View advanced settings" button. 4. Under advanced settings, scroll down and can click the "Change search engine" button. Bing will probably be set as the default. 5. Click "Good Gopher (discovered)." Good Gopher should now be selected. Now click the "Set as default" button. That's it! 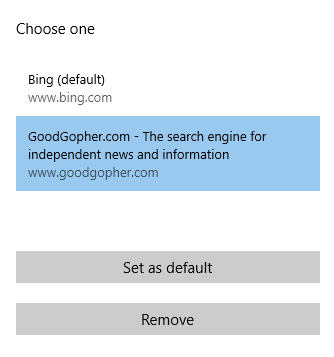 Good Gopher is now your default search engine when searching using Edge's address/search bar. 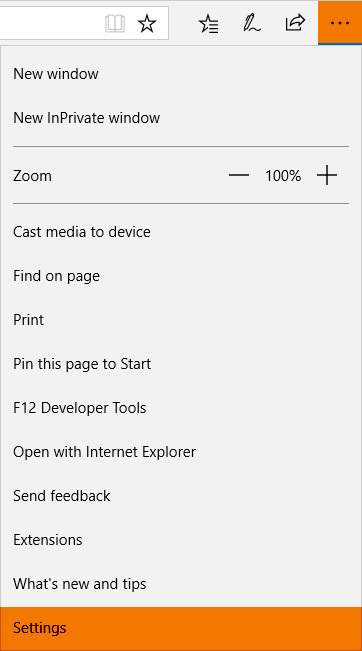 For more information, please see Microsoft's Edge support page.